Last week, Nico and I attended Maxine Hong Kingston's reading at the Hammer. It was an event I'd been looking forward to for a long time, since from her picture, Maxine looked so adorable: a little old Chinese lady with long white hair and a mischievous twinkle in her eyes. "A writer takes on the responsibility of making culture." Throughout her work, especially in The Woman Warrior, Maxine combated stereotypes of Chinese people on TV and in the movies. She described Chinese culture as a culture in which writing is sacred. It's a culture where you can send letters to your dead by burning them as offerings. Where every scrap of writing used to be collected and incinerated separately from the trash, the ashes scattered in the ocean. There's a Chinese saying, she said, that you can squeeze poetry out of people. I've never thought about my writing as a cultural inheritance, so I was proud to discover this ancestral appreciation of writing, as if reverence for the written word was coded into my DNA. "I have a superstition that as long as I--as any writer--have things to write, I keep living." Maxine is a dragon in the Chinese zodiac. In Chinese culture, the dragon is a water dragon like the mist that hangs over the mountains. She said her writing came out of that mist, a description of inspiration as poetic as I've ever heard. She told us she often succumbed to magical thinking. She'd see an ancient Chinese whistling arrow in a museum and wonder whether she saw it in the past and subconsciously incorporated it into her fiction, or whether the arrow itself existed because she'd imagined it in her fiction. Don't all writers think like that? The world you imagine and the world you perceive can't be too different. I often take cues from my writing. People have walked into my life after I've written them into stories. People who look like my characters, who share their names. I'm drawn to people who remind me of the characters I've created. And the characters I create often reflect those close to me. "A writer's life is so terrible. Everyone's having a party, but you can't go because you have to sit at home and write." For Christmas, Ellen gifted me a gorgeous black wood bookshelf from Ikea. 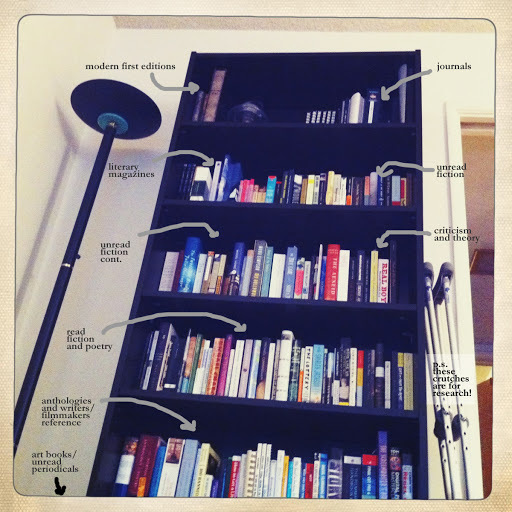 The bookshelf stands 8 feet tall. It could kill you if it fell on you. It looms over the TV and hungers for books. I brought books from home to fill it. Now I have a periodical section, a poetry section, a modern first edition section, and a critical theory section. I moved my old bookshelf (black bookshelf minor) into the dining nook for additional periodicals, library books, cooking and LA reference. What goes better with tea and cookies than a back issue of One Story or LA Magazine?